When you present in Kiosk Mode, iMindMap will automatically play your presentation for you and navigate through your slides based on a slide time you have set. Navigate to the main toolbar and select 'Settings'. When the settings pop up appears, you will see the 'Show slides for' option - here you can choose how long your slides will play for. If you would like to set individual times for each slide or just for certain slides, select your chosen slide(s) and click the 'Timing' icon located in the main toolbar. Set a value for your chosen slide. Navigate to the main toolbar and select 'Kiosk'. 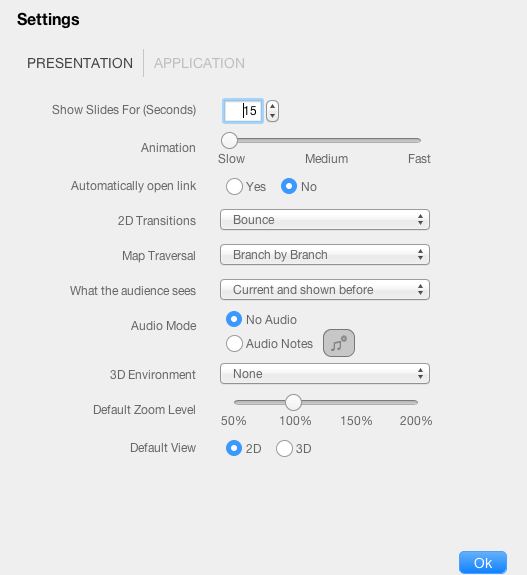 Your presentation will now begin automatically, giving you the freedom to present hands-free. Press 'ESC' on your keyboard. Navigate to the main toolbar and select Presentation > Settings. When the settings pop up appears, you will see the 'Show slides for (Seconds)' option - here you can choose how long your slides will play for. Navigate to the main toolbar and select Presentation > Kiosk. Click 'Begin' on the next pop up. Your presentation will now begin automatically, giving you the freedom to present handsfree.